3D echocardiographic (3DE) imaging is a useful tool for assessing the complex geometry of the aortic valve apparatus. Segmentation of this structure in 3DE images is a challenging task that benefits from shape-guided deformable modeling methods, which enable inter-subject statistical shape comparison. Prior work demonstrates the efficacy of using continuous medial representation (cm-rep) as a shape descriptor for valve leaflets. However, its application to the entire aortic valve apparatus is limited since the structure has a branching medial geometry that cannot be explicitly parameterized in the original cm-rep framework. In this work, we show that the aortic valve apparatus can be accurately segmented using a new branching medial modeling paradigm. The segmentation method achieves a mean boundary displacement of 0.6 ± 0.1 mm (approximately one voxel) relative to manual segmentation on 11 3DE images of normal open aortic valves. 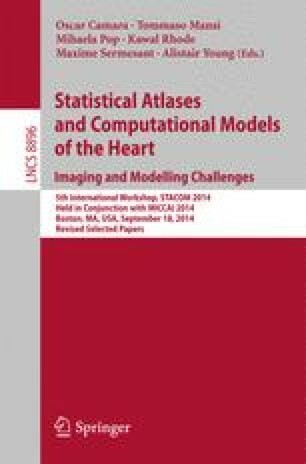 This study demonstrates a promising approach for quantitative 3DE analysis of aortic valve morphology.